For the second straight year, the Capital City News won the Louisiana Press Association’s highest award for community journalism — 1st Place for General Excellence. This award takes into account the newspaper’s news coverage, photography, editorial comment, layout, advertising, and all other factors. More than 110 daily and weekly newspapers and specialty publications are eligible to participate in the competition. No one in Louisiana is involved in the judging. Each year, the LPA partners with a newspaper association in another state. Editors from Louisiana judge that state’s contest entries, and editors from that state judge Louisiana’s entries. This system is designed to keep bias and favoritism away from the judging. 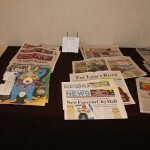 The Capital City News is a newcomer to statewide competition. It began publication in 2012. However, it is a continuation of the South Baton Rouge Journal, which went on hiatus in 2008. The Capital City News shares the same staff as the Central City News. The editor of both is Woody Jenkins. They are owned by Community Press, LLC, which is based in Baton Rouge, and are published on the first Thursday of each month, except January when they are published on the second Thursday. To send news or to advertise, email centralcitynews@hotmail.com.